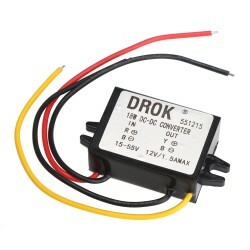 It is a 15W Buck Voltage Regulator/Adapter/Car Converter, Input voltage: DC 8~55V, Output Voltage.. 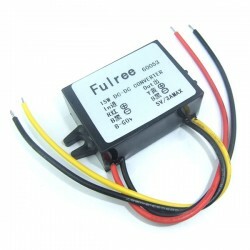 It is a 18W Adapter/Power Supply Module/Car Converter, Input voltage :DC 15~55V, Output Voltage: .. It is a 240W Buck Car Power Supply/Adapter/Voltage Regulator, Input voltage: DC 48V (wide voltage range: DC30~60V, adjustable), Output voltage: DC 24V(non-adjustable), Output current: 10A, It has small size, high efficiency, long term stable and reliable quality,easy installation and use. Application: Wide application electric motor, audio equipment, GPS navigator, air conditioner, electric fan, LED lights, LED vehicle display, solar battery and other industrial electric. Adopts Adopts synchronous rectification technology, high conversion rate(above 902%), low heat and stable. Uses embedding technology, waterproof, dust-proof,moisture-proof, shock-proof and can be applied to various poor working condition. With aluminum alloy shell, safe and better heat dissipation. Electric motor, audio equipment, GPS navigator, air conditioner, electric fan, LED lights, LED vehicle display, solar battery and other industrial electric equipment.